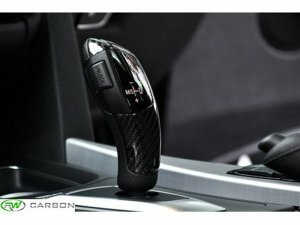 Are you looking to add some interior carbon fiber accents to your BMW? RW Carbon has the perfect item for you with this Carbon Fiber Gear Selector Cover. It is the perfect piece to spice up the interior of your BMW or to finish off your CF theme. It is made out of durable ABS plastic that is then overlayed with real Twill 3k weave carbon fiber. Once the gear selector cover is finished, each one is give a clear coat spray to give you a beautiful glossy shine and protect it from fading. RW Carbon carries both selector covers, one for the Sport or M Sport Models and one for the Non Sport models. This cover is designed for Non Sport BMWs. Please go back to the interior parts page if you have a sport model.